My good friends Donno and Judi just got back from a marvelous Caribbean vacation, and as you can imagine, ten days of lounging, swimming, and imbibing in the tropical sun did them nothing but good. Since their return to NOT QUITE SO SUNNY nor NEARLY AS RELAXING Philadelphia, they have spent several evenings reliving the glory of their time spent abroad via the cocktail shaker. 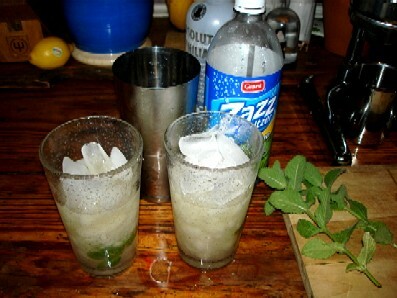 When I stopped by the other night I was of course proffered one of Donno’s magnificent mojitos, and WOWEEEEE! So, today, in honor of the holiday weekend, Donno has graciously offered to stand in as the first ever “Guest Chef” here at The Daily Dish. These mojitos take a little effort, but are more than worth it. Fresh, lip-smackingly invigorating, they’ll leave you and your lucky guests begging for more. 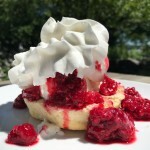 Many thanks to Donno for the wonderful recipe, photos and instructions. 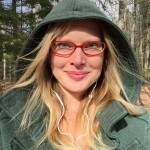 Now onto the show…. The first thing you need to do is make some minted simple syrup. This is pretty easy. 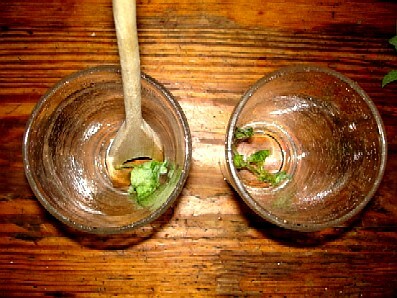 Heat 2 cups of water in a pot, add to that a sprig of mint or two which you have bruised (just crumple it up in your hands and drop it in the water), and stir in 2 cups of Turbinado (unrefined) sugar. Regular white sugar can be used in a pinch, but it’s just not the same. Bring it slowly to a very gentle boil and then remove from heat. You don’t want it to boil over- it will make a spectacularly sticky mess. Trust me. 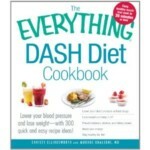 Allow it to cool, then pour it into a bottle with a stopper and keep it in the refrigerator. For some reason mine is in an Absolut Vanilla bottle. 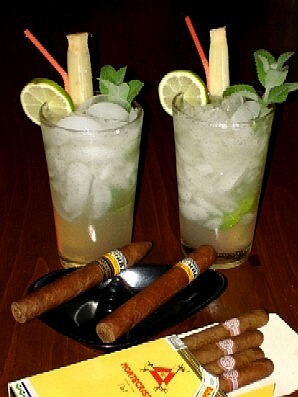 To make the Mojitos, you will need all the ingredients listed above. 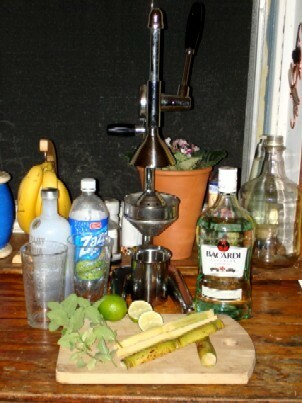 In addition, you will also need a cocktail shaker, a tall glass (there are purpose made mojito glasses, a collins glass will work, or even just a large drinking glass like I use) and a muddler. If you haven’t a muddler (like I don’t…yet…), a wooden spoon can be used with reasonable success. 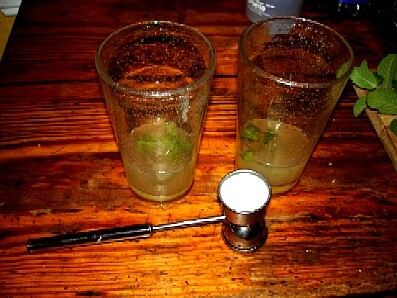 First you throw the 4 mint leaves into the glass, and smoosh ‘em up good with the muddler (muddle them!) or wooden spoon, being sure to rub them all over the inside of the glass, spreading the wonderful essential oils from the crushed leaves all over the inner surface. Next pour the simple syrup, lime juice and rum into the glass with the crushed leaves. Fill the glass with ice. Pour this mixture into the cocktail shaker and shake well. Pour it all back into the glass, and fill the glass the rest of the way with seltzer or soda water. Now pour THIS mixture BACK into the cocktail shaker, and DON’T SHAKE IT! 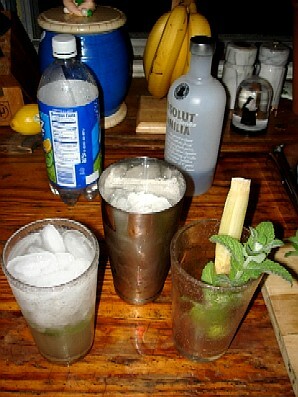 Put the fresh mint sprig into the glass (also the sugar cane, if you are using it- it’s a classy touch, I recommend it!). Now pour the drink back into the glass. You can now add a slice of lime to the rim of the glass, throw in a straw or perhaps even a cocktail umbrella if you are so inclined, and enjoy!